The picturesque parish square in the agricultural village of Mġarr will be hosting Festa Frawli (Strawberry Fair) once again today. Now in its 12th edition, this event is a much-awaited fixture in the Maltese calendar. 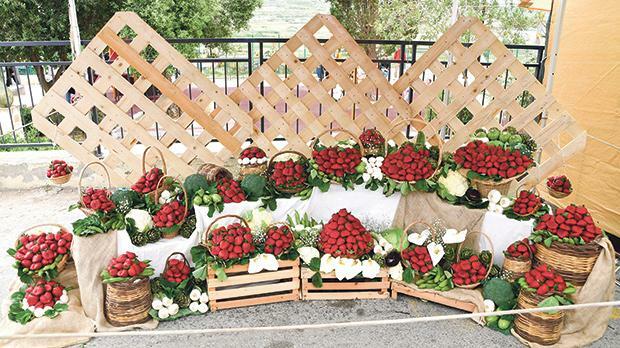 The Strawberry Fair represents the vibrant Mġarr community, bringing together farmers and local volunteers in a communal celebration of the spring strawberry harvest. Central to its focus, the fair continues to preserve and enhance the agricultural and historical legacy of the renowned local strawberry and Mġarr’s agriculture. Thousands of strawberries are picked, prepared and packed. Due to the high demand on the day, native farmers continue to hand pick fresh strawberries during the event itself so that a steady supply of strawberries is available throughout. One will also find a range of strawberry-inspired desserts such as jam, ice cream, cheesecakes, ravioli, spring rolls, arancini, cakes, smoothies and milkshakes. One can also purchase strawberry wine, liquors, lemonade and strawberry cocktails. Various eco-activities and interactive games will be organised by a team of animators to keep the little ones busy. Festa Frawli will also be filled with traditional Maltese entertainment, with folk groups playing instruments like iż-żaqq (Maltese bagpipes), it-tambur (Maltese tambourine) and il-flejguta (Maltese folk flute). For the first time, trail walks and photo hunts will be organised for visitors to experience the rustic surroundings that embrace several scenic spots linking various sites of immense archaeological, historical and natural value such as Binġemma and the coastline extending from Għajn Tuffieħa Bay to the sheltered bay like Ġnejna. To attend, one can catch bus numbers 44 and 238 from Valletta and bus number 101 from Ċirkewwa to Mġarr throughout the entire day. A Park and Ride shuttle service will be provided from the open-air gym at Ta’ Qali and parking areas in nearby fields will be organised to facilitate accessibility. This event is organised by Mġarr local council and Kummissjoni Lejla Mġarrija with the help of hundreds of volunteers.